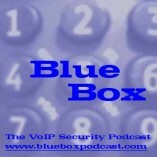 Blue Box: The VoIP Security Podcast: Blue Box podcast #70 successfully recorded... on *conference WiFi*! Blue Box podcast #70 successfully recorded... on *conference WiFi*! 0.0% packet loss on receiving Jonathan's signal! Very cool! And a 94ms round trip sure beats a 200-300ms round trip, eh? To get this good quality on a conference WiFi really speaks to the efforts of the Interop NOC team to deliver this kind of network. Kudos to them! For those curious, I recorded the show locally on my MacBook Pro using WireTap Studio from Ambrosia Software. Given that our recording levels were quite different, I'm probably going to need to run the recording through the Levelator in order to bring the levels in line. It should be posted probably some time early tomorrow. I'm at Interop all day today and so the post-production will probably be done during my time out at JFK and flying home later today. Did you see this snippet from Reuters yesterday? I am curious as to what the background of this Vonage exploit might be, and why it might have hit the newswires. Something old or something new? Will you mention it in Podcast #70? David, Yes, we do talk about it on BBP 70 and I also intend to write a Voice of VOIPSA blog post about it. The eavesdropping item is really old news in that we've been talking about this weakness in consumer VoIP services for most of the two years of Blue Box! The other SIP exploits are ones I haven't heard of, but I'm not terribly surprised to learn of them because they are the typical type of exploit that people need to test for - but yet we're seeing that people don't.